The industry needs motors—lots of them—in all sizes and with wide-ranging features and capabilities. Depending on the application, these motors might be installed indoors or out, some in clean rooms and others in harsh industrial environments. Their power can range from less than 1 horsepower (hp) to more than 5,000 hp. Some are designed to be mounted vertically; others, horizontally. Because of these variations, the design, installation, operation and maintenance can differ, especially when comparing horizontal and vertical motors. Failing to recognize these critical differences can lead to serious operational problems, particularly during installation and startup. Conversely, the more a user knows about these differences, the more likely the motors and equipment they drive will enjoy long, productive lives. Here are six key differences that are critical for users to understand. Electrically, vertical and horizontal motors are similar. But mechanically, they are constructed differently due to the applications and cooling requirements. Vertical motors—deemed “definite purpose motors”—are primarily used with pumps and other low-inertia, variable-torque applications. Horizontal motors are used in both variable-torque and constant-torque applications, including pumps, fans, compressors, cranes and conveyors. Vertical motors are directly connected to the equipment they drive. Because these are designed to take high loading in the axial direction, but little in the radial direction, they are exclusively mounted in a vertical position on their flanged base. The base should be stable with the shaft perpendicular to it with minimal run-out. This is important on hollow-shaft motors because a nonperpendicular shaft can destroy the upper thrust bearing almost immediately. While normally mounted horizontally, horizontal motors are sometimes mounted vertically for use with small pumps, gearboxes and other equipment. Foot flatness is critical when the motor is mounted to its base. The sole plate or mounting base must be properly grouted so there is no distortion or shifting over time, which can lead to alignment and vibration problems. The most critical design difference between horizontal and vertical motors is the bearing system design. A general purpose horizontal motor is typically built with external shaft loading in either or both the radial or axial direction. Larger horizontal motors frequently use oil-lubricated rolling element bearings (ball or rollers) or hydrodynamic, oil-lubricated sleeve bearings. While rolling element bearings operate with loading in the radial or axial direction, hydrodynamic sleeve bearings withstand little axial load and are designed for moderate radial loads—usually no more than the rotor’s weight. Vertical motors, on the other hand, are expected to handle the axial or radial thrust associated with the pump they are driving. They typically have a single thrust bearing, along with a single guide bearing. Thrust bearing selection is based on load, with alternatives available to handle anywhere from 10 to 1,000 times the axial load of a typical horizontal motor. The guide bearing is not expected to handle significant load during regular operation. In calculating bearing life, it can be difficult to determine the actual loading on a bearing. Premature failure can occur if the calculation or thrust load is inaccurate. Premature bearing failure in a vertical or horizontal motor is often due to the maintenance staff using the wrong—or wrong amount of—lubricant. Lubricant selection is based on multiple factors, including temperature, exposure to moisture or other contamination, motor speed and bearing type. The best practice is to follow the recommendations of the motor’s manufacturer, many of which include relubrication instructions on a nameplate directly on larger vertical motors. 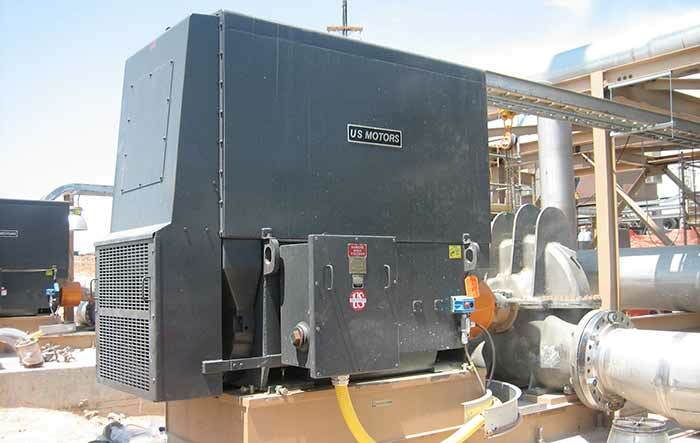 For horizontal motors, this information is often found in an operations manual. Before making substitutions to the recommendations and risking premature failure, it is important to communicate with the manufacturer. When relubricating hydrodynamic bearings, for example, it is often a mistake to change oil viscosity. Oil film thickness is critical on horizontal sleeve-bearing vertical motors, where it can lead to severe oil leakage. On vertical oil-lubricated motors with higher-than-normal ambient or operating temperatures, a synthetic lubricant may be used. The motor manufacturer can provide guidance.